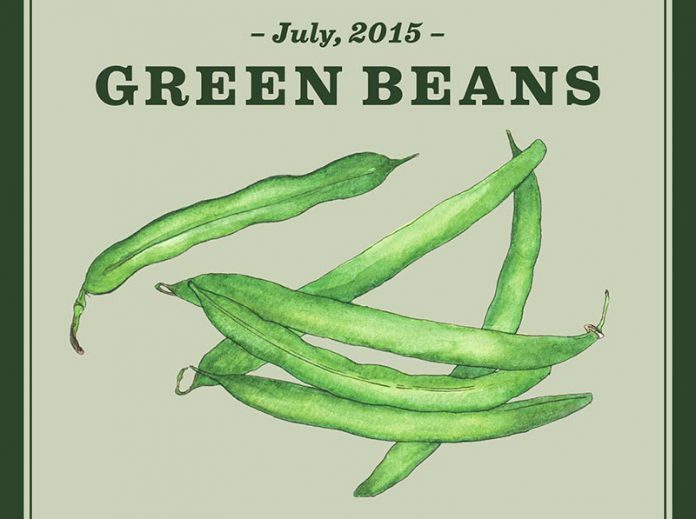 This July we celebrate green beans, a workhorse in the garden, as our Harvest of the Month. Bean seeds boast beautiful colors and patterns, sprout quickly, and in about two months you are rewarded with a bountiful return on your one-seed investment. If you haven’t already, consider putting a few plants or a whole row into your garden to enjoy a late September harvest. In the meantime, stop by a local farm stand or market and pick up a bag. Beans are incredibly versatile in the kitchen. You can eat them fresh with a hummus dip, chop them into salads, or just pack in a baggie to take to the beach. Also consider making dilly beans, a delicious pickled treat. This month we are excited to try this recipe by Harvest of the Month Chef Robin Forte for Portuguese-Style Green Beans. Heat oil in a large skillet. Sauté onions until golden, add tomato, garlic, bay leaf, green beans, water, salt, cumin and vinegar. Simmer until the beans are tender, about 12 minutes. Add the optional linguica and red pepper flakes.